Does it Taste as Good as it Smells? Do you know, I’ve never tasted Earl Grey? I have absolutely no idea what it would be like. I haven’t ever drunk a cup of proper tea (non-herbal stuff) and I’ve only ever once sipped a bit of coffee. But I quite like coffee chocolates and Tiramisu, and I bloody love this Earl Grey candle from Orla Kiely, so there must be a frustrated tea/coffee drinker inside me somewhere. If anyone who gets this candle also drinks Early Grey, can they please let me know whether the drink tastes as good as the candle smells? Because if it does, I may have to become a hot drink convert. Remember my review on the Jo Malone Cricket Pavilion Cologne? (Earl Grey and Cucumber, I think it was supposed to be called.) Well this candle reminds me of that fragrance a lot. It’s incredibly fresh and sparkly, but not in that sharp, citrussy way that smells like toilet freshener, no: this is a classy Bergamot number. Bergamot that’s also a bit warm and spicy, like a midnight mediterranean garden in the height of summer. 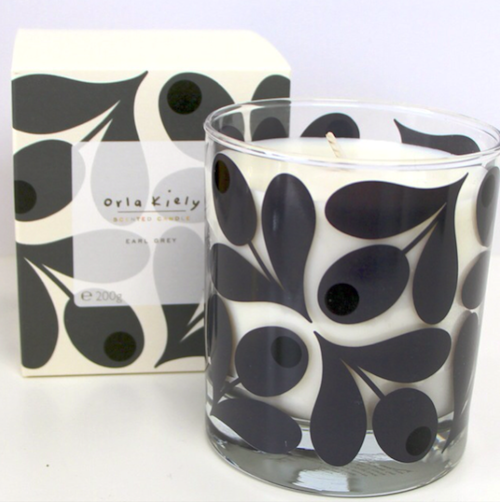 I think that the Orla Kiely home range is very good – I have yet to try the reed diffusers, but the candles are great. Pretty jars, beautiful scents and not too expensive at all.